"The social media response has been phenomenal - to have fans shouting out for Alex during big football matches has been surreal – I can’t wait to see where Alex’s journey leads next." REDWOOD CITY, Calif.--(BUSINESS WIRE)--Today Electronic Arts Inc. (NASDAQ:EA) announced EA SPORTS™ FIFA 17 The Journey was played at a rate of more than 178,000 matches per hour from September 24, 2016 to October 24, 2016 on Xbox One, PlayStation 4 and PC*. That equates to 124 million matches in that month, with Alex Hunter scoring more than 164 million goals over the course of those matches by players in more than 180 countries. Currently available in English with subtitles in several languages, The Journey will be able to be played in French, German, Italian, Spanish, and Mexican Spanish this fall via a title update**. The Journey inspires fans to live their story on and off the pitch as Alex Hunter, the Premier League's next rising star. Alex’s story is impacted by performance in matches and decisions made by fans off of the pitch, like selecting which of the twenty Premier League clubs Alex signs with to begin his professional career. With a record 20 League titles, Manchester United has been the fan-favorite with 18% of players selecting the Red Devils. Liverpool FC (11%), Leicester City Football Club (11%), Arsenal (10%), and West Ham United (8%) round out the top five. No matter the club, there’s been no shortage of silverware for Alex Hunter, with fans winning more than 560,000 Premier League titles and more than 1 million FA Cup titles. 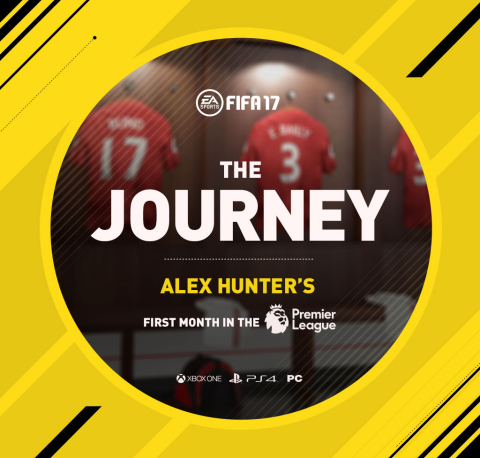 The Journey helped to engage 20% more players in FIFA 17 in its first week than FIFA 16 did in the same timeframe last year, and other modes are also seeing high engagement. More than 366 million matches have been played in FIFA 17 Ultimate Team™ across all platforms combined, with fans experiencing new events like FUT Ones to Watch and new competitive ways to play like FUT Champions*. November marks the first month fans will be eligible to qualify for EA SPORTS FIFA 17 Ultimate Team Championship Series***, part of a full season of competitive gaming within FIFA 17. For more information on the EA SPORTS™ FIFA 17 Ultimate Team™ Championship Series click here. EA SPORTS FIFA 17 is now available on Xbox One, PlayStation®4, PC, Xbox 360, and PlayStation®3*. Fans can learn more about new gameplay features of FIFA 17 by visiting the website, and becoming an EA SPORTS FIFA Insider. Fans can also join the EA SPORTS FIFA community on Facebook, Twitter and Instagram. The game is rated E for Everyone by the ESRB. *FROSTBITE GAME ENGINE TECHNOLOGY, THE JOURNEY, AND FUT CHAMPIONS ARE AVAILABLE ON XBOX ONE, PLAYSTATION 4 AND PC PLATFORM VERSIONS ONLY. ***Qualification for the EA SPORTS FIFA 17 Ultimate Team Championship Series is only available to eligible players on Xbox One and PlayStation 4. No other platforms and consoles are supported for qualification. Residence in eligible countries required. Final terms and structure subject to change. See OFFICIAL RULES for full details at http://futchampions.com. EA SPORTS™ is one of the leading sports entertainment brands in the world, with top-selling videogame franchises, award-winning interactive technology, fan programs and cross-platform digital experiences. EA SPORTS creates connected experiences that ignite the emotion of sports through videogames, including Madden NFL football, EA SPORTS™ FIFA, NHL ® hockey, NBA LIVE basketball, Rory McIlroy PGA TOUR ® golf, and EA SPORTS UFC ® . EA, EA SPORTS, Origin, Frostbite, The Sims, Dragon Age, Plants vs. Zombies, Ultimate Team and Battlefield are trademarks of Electronic Arts Inc. and its subsidiaries. John Madden, NFL, PGA TOUR, NHL, NBA, UFC and FIFA are the property of their respective owners and used with permission.